The international mining technology trade fair Euro Mining 2013 was held in Tampere on the 11thand 12th of September. The first ever EuroMining trade fair had 191 exhibitors from 11 countries. The event attracted a total of 3874 visitors. The EuroMining trade fair was opened by Mari Pantsar-Kallio, Strategic Director of the Ministry of Employment and the Economy, who also presented the first ever Environmental Contribution of the Year award as part of the opening seminar. This new award was given to drilling contractor Oy Kati Ab Kalajoki (KATI). 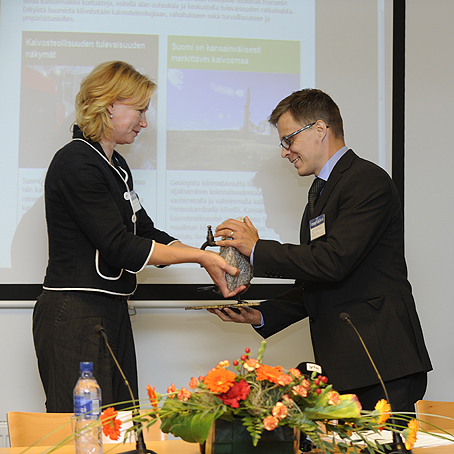 The award was accepted by KATI’s Business Manager Matti Rautakoski. The new hall E of the Tampere Exhibition and Sports Center was used for the first time to hold the event. Extractive industries wanted in Finland, but not at any cost. In terms of employment, the extractive industry is one of the most promising industrial sectors in Finland. The mining industry in particular has grown significantly over the past few years. The net sales of mining companies in Finland total approx. EUR 1.5 billion and the industry provides employment for 4,500 people. The number of employees is expected to exceed 7,000by 2020. However, the entire cluster is of more importance to Finland. The entire extractive industry provides employment for some 30,000 people and the export of processed metals accounts for approx. 15%of Finland’s total export. The strong growth of Finland’s mining industry is, however, in danger of slowing down due to the global reduction of metal prices, environmental challenges, slow administrative procedures and the acquisition of a social license to operate. For the extractive industry to grow it requires investment in more responsible, voluntary activities, improvement of the administrative procedures and development of international cooperation in order to, for example, accelerate the promotion of export. “We have invested in environmentally friendly activities for over ten years. We see this Environmental Contribution of the Year award not only as an acknowledgement of our work, but also as an incentive to continue with what we are doing. Our company’s core values include respecting the environment and developing our operations so that the environmental impact is minimal. Our main service is diamond drilling which means drilling rock samples from the bedrock, often in the middle of unspoiled nature, in swamps and forests. Working in the middle of the wilderness requires an ability to assess your activities critically and the willingness to invest in continuous development work. We want to do our part in strengthening the mining industry as an industry where the interest of the environment is a high priority,” says KATI’s Business Manager Matti Rautakoski. KATI has been operating in the field of mining and mineral exploration for over 30 years. The company’s main service is diamond drilling which can produce rock samples from a depth of 2,000 meters. The ISO14001 environmental management system was certified ten years ago and it has been an important tool in developing the company’s operations according to the principles of sustainable development. The jury said that the certification of KATI’s environmental management system as the first drilling contractor in the Nordic region, the personnel’s commitment to environmental values and the efficient drilling equipment developed within the company decided the recipient of the award. As one of the outcomes of the company’s development work, the jury mentioned KATI’s closed-cycle system which is suitable for Nordic conditions and which enables the reduction of water consumption in the drilling process and leaves fewer traces in the environment. In addition to Finland, the biggest mining technology trade fair in Europe attracted visitors from 20 other countries: Australia, Botswana, Chile, China, France, Germany, Ghana, India, Indonesia, Kazakhstan, Norway, the Philippines, Russia, South Africa, Sweden, Tajikistan, Turkey, the United Kingdom, Uzbekistan and Zambia. All press releases about the EuroMining 2013 trade fair are available on the event’s website at www.euromining.fi (Media). For image material, plea se contact: aino.paavola@tampereenmessut.fi.